In northern New Mexico, the small, family-owned Sipapu Ski Area is battling the little farming town of Dixon over water rights to the Rio Pueblo and Rio Embudo, tributaries of the Rio Grande. Plus, the endangered silvery minnow is forcing the water users of the Middle Rio Grande in New Mexico to reconsider the ways cities, towns, pueblos and farms have always made use of the river. 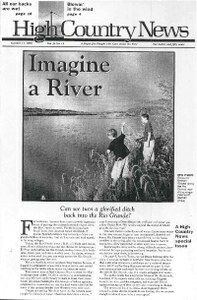 An introduction to this special issue describes the work and cooperation needed from all the Rio Grande's users if the river is to ever flow freely again. In northern New Mexico, the small, family-owned Sipapu Ski Area is battling the little farming town of Dixon over water rights to the Rio Pueblo and Rio Embudo, tributaries of the Rio Grande. The endangered silvery minnow is forcing the water users of the Middle Rio Grande in New Mexico to reconsider the ways cities, towns, pueblos and farms have always made use of the river. Marie Coburn, mayordoma of an acequia that waters the small farms of Dixon, N.M., works to make sure that the 98 farmers on the ditch get the water they are entitled to. In his own words, artist and scholar Nicasio Romero talks about the threats facing the centuries-old acequia farm culture of New Mexico. Some river activists and farmers worry that Subhis Shah, chief engineer and CEO of the Middle Rio Grande Conservancy District, is out to start a "water-banking empire" rather than conserve water. Overjoyed at the ruling that means the Dry Lake volcanic area near Flagstaff, Ariz., will not be developed as planned, an activist still feels compassion for the developer, remembering her own gambling days and how it feels to gamble and lose. Watching as an illegal immigrant is arrested near Rio Rico, Ariz., the author considers the risks that border-crossers must take, and remembers that his own great-great-great-grandfather was once an immigrant, too. "Mz. Prairie Dog" pageant in Camas, ID; armed Boy Scouts; lightning strikes elk; poachers sentenced near Craig, CO; moose misbehavior; "Hell House" in Arvada, CO; homophobia in Elk City, ID, church; outfitter survives 200-ft. fall in his Subaru. Research Fund; HCN's Paonia board meeting and potlucks; our circulation numbers; a lavish book, "Colorado 1870-2000" by John Fielder and Ed Marston; visitors. Developer Jim Sievers wants to build an exclusive wilderness playground on the inholding he owns in the middle of Montana's Absaroka Beartooth Wilderness. Idaho Lt. Gov. Butch Otter fined for dredging wetlands without permit; Jon Marvel outbids millionaire for grazing parcels; Wyo. ranch manager gets permit to kill wolves; Mark Alldredge abandons mining claims on Rocky Mtn. Front; Blue Ribbon Coalition. Developer Jim Mehen is ordered to scale back his development plans for the Dry Lake volcanic area near Flagstaff, Ariz.
A new sport called sandboarding is becoming popular in Park Service wilderness areas with dunes, and some worry that it is a form of recreation "not compatible with wilderness values." Locals and environmentalists are concerned about development plans for a 400-acre resort right next to Mount Rainier National Park and the little town of Ashford, Wash.
Environmentalists are rejoicing at the decision, largely economic, to demolish Condit Dam in southeastern Washington. Farmers in San Luis, Colo., are upset that pollution from a defunct gold mine owned by Battle Mountain Gold is leaking into Rito Seco Creek, which feeds their irrigation ditches. A draft for the 15-year management plan for Colorado's White River National Forest has sparked controversy from everyone, from Vail Resorts and ATV operators to some environmental groups.